Have some doubts about the structural integrity of your snack stadium? Or don't wanna shell out for those pricey chicken wings? You can still save your game-day spread with a pizza that riffs on the Seahawks' star player -- provided you don't mind some extra sugar in your slice. Ahead of Super Bowl Sunday, the pizza stone company Baking Steel created a specialty Skittles pie for Marshawn Lynch, who is quickly becoming a more noted candyman than Wonka himself. Rather than subject you to the horror of red sauce mixed with Skittles, Baking Steel turned the pizza into a dessert pie. 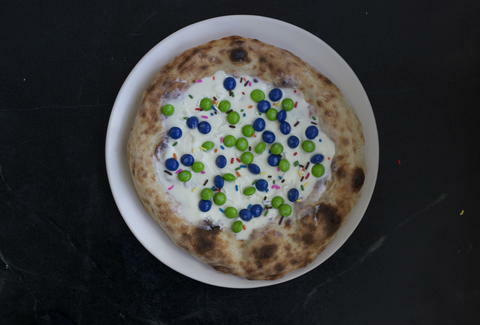 While it still has your standard dough, Pillsbury frosting takes the place of sauce/cheese and Skittles & sprinkles serve as the toppings. For the sake of fairness, Baking Steel also made a pizza for the Patriots, but that one was a more traditional sausage pie, concocted for meat-loving tight end Rob Gronkowski. The company, which began as a Kickstarter project in 2012, has both recipes on their site if you feel like making your own pizza this year. Considering the delivery dude probably won't make it to your house until 8:30 anyway, it might just spare you the wrath of hangry party guests. Kristin Hunt is a Food/Drink staff writer for Thrillist, and hopes one day she loves anything as much as Marshawn Lynch loves Skittles. Follow her at @kristin_hunt.